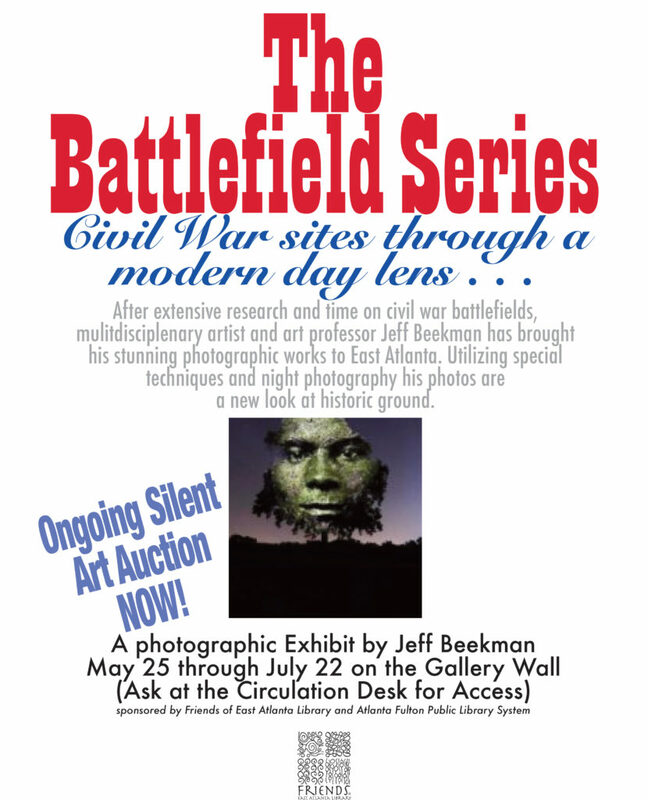 FSU Art Assistant Professor Jeff Beekman’s “Battlefield Series” is showing in East Atlanta this summer. The Friends of East Atlanta Library are proud to present the display, which will remain up through the month of July and through July 22nd, the anniversary of the Battle of Atlanta. Beekman is a multidisciplinary artist whose work since early 2000 has explored the interrelationships between land, memory and human activity. Over the past few years, this has taken the form of photographic works, exploring the highly-negotiated spaces of U.S. Civil War battlefield sites. Particular attention is paid to how these sites have evolved from the scarred and blood-soaked fields where often tens of thousands fell and died into the tourist attractions, running trails, research sites, and re-enactor playgrounds they are today. Most recently, Beekman has been exploring the history of United States Colored Troop units in these locations, and how the efforts and sacrifices of these black soldiers are specifically memorialized. The photography presented at the library now was mostly shot on the battlefields at Gettysburg at night and then combined through projections with other historical images found in research by the artist. The result is striking. The Friends of the East Atlanta Library will host a free artist talk at the Jimmy Carter Library on Thursday July 20th at 7:00pm where Beekman will present a slideshow and talk about the Battlefield Series as well as some of his more recent works. Then on Saturday July 22nd from 3:30 until 5:30 there will be an artist reception at the East Atlanta Library with wine and other refreshments. The the Battle of Atlanta Commemoration Organization (BATL) has a long history of partnering with the Friends of East Atlanta Library and these programs have been scheduled in conjunction with this year’s commemoration of the battle. There will be a tour as well as the wreathlaying ceremonies at the two monuments. More information about the artist programs and other July activities can be found on the web at www.batlevent.org.